Don’t forget to collect your Kyton’s order TOMORROW (Wednesday) night at the clubrooms STRICTLY 6-730pm. Thank you for making our fundraiser such a success!! SA 17/U THROUGH TO THE GOLD MEDAL MATCH! SA (37) produced a dominant display to defeat WA (26) in the Semi Final this morning and will now play for gold in the Grand Final tomorrow. Match opponent and time TBC. As you may have realised we have launched our new look website in conjunction to the improving brand identity of the club! We hope you like the new look and feel to the website as much as we do! 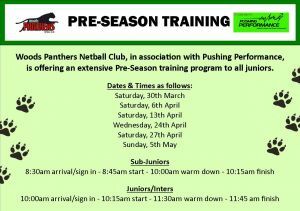 In conjunction with Pushing Performance, Woods Panthers Netball Club is offering an extensive preseason training program for all Junior players. Check out the flyer below for all dates and more information! Woods Panthers Netball Club would like to congratulate Rachel Redden on her selection into the 2019 U/17 South Australian state netball team. Rachel joins the squad of 12 who will be travelling to Brisbane in April to compete in the National Netball Championships. After another successful AGM Woods Panthers Netball club would like to welcome all exisiting and new committee members to the 2019 season. We look forward to working with you all closely. If you have any queries for any of the members please contact them directly. For more information please talk to your Divisional Coordinator.